The 31st annual Miami Yacht Show, the city’s premier luxury yacht and superyacht show, is set to take place over Presidents Day Weekend in Miami, February 14-18, 2019, at its new downtown Miami location at One Herald Plaza. The show, which will spread between the MacArthur and Venetian causeways on Biscayne Bay and include Sea Isle Marina, is in closer proximity to the show’s Super Yacht Miami at Island Gardens on Watson Island. The 31st annual Miami Yacht Show leaves its Miami Beach venue after 30 years. The 2019 yacht show promises to be more spectacular than ever before with a 60-acre display that includes a massive 67,000-square-foot exhibition space and nearly 500 stunning yachts from the world’s foremost yacht and superyacht manufacturers and brokers. The yachting event draws a global audience of over 29,000 visitors and generates an estimated $486 million in economic output. New attractions featured for the first time in the on-land exhibit space will include pop-up luxury retail, guest lounges and bars, exotic cars, private aircraft, and special events. The show also will reimagine its exclusive VIP offering to introduce the Windward VIP Experience, which will offer a premium open bar, gourmet food, happy hours, and exclusive events, serving as a sanctuary to enjoy the show in a unique indoor/outdoor environment. Tickets to the Windward VIP Experience are $200 per person per day and include valet parking and water taxi service throughout the show and to and from Super Yacht Miami and the Miami International Boat Show on Virginia Key. The weekend also coincides with Art Wynwood, a contemporary and modern art fair produced by Art Miami and held adjacent to the Miami Yacht Show. Visitors will be able to cross each site easily, introducing more art lovers to the world of yachting. The Miami Yacht Show also will partner once again with the second edition of Watches & Wonders, taking place in the Miami Design District from February 15 to February 17, 2019. Watches & Wonders unites 28 of the top luxury timepiece and jewelry brands in the world to form a three-day program filled with events for watch and luxury aficionados. At Watches & Wonders, visitors also will be able to experience Miami Concours, which will showcase an exclusive presentation of incredible rare vintage, sports and exotic cars from major U.S. collectors. A shuttle service to and from the Miami Yacht Show and the Miami Design District will make this an essential part of both programs. The new Miami Yacht Show site is located at One Herald Plaza, between the MacArthur and Venetian causeways on Biscayne Bay, next to the Adrienne Arscht Center for the Performing Arts and including Sea Isle Marina. The show is just minutes from major interstates and renowned shopping districts. Offering more than 3,500 parking spaces within walking distance of the show and easy access from Brightline and the Metromover, the new venue makes getting to the show more convenient than ever before. Water taxi service will connect the mainland location to Super Yacht Miami, the Miami Yacht Show’s satellite display of extraordinary superyachts catering to brokers and their clients at Island Gardens Deep Harbour on Watson Island, and the Miami International Boat Show on Virginia Key. 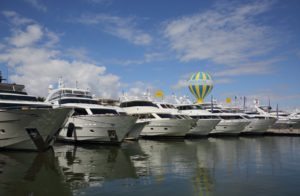 The Miami Yacht Show runs concurrently with the Miami International Boat Show, which is owned and operated by the National Marine Manufacturers Association (NMMA). Collectively featuring over 2,000 boats, the two shows together create the largest marine event in the world. Visitors can purchase a joint ticket for admission to both shows and choose several modes of convenient transportation between the two events. General admission tickets to the Miami Yacht Show are $28 per day. Children 12 and under are free. Tickets for Thursday, February 14th, considered Prime Time Preview, are $43 per person. The combo Miami Yacht Show and Miami International Boat Show Premier Day admission is $83; general admission combo tickets are $53 per day. For more information on ticket pricing, show hours, transportation options, activities and more, visit MiamiYachtShow.com. To download hi-res images and video or to register for media credentials to attend the Miami Yacht Show, visit our online newsroom at MiamiYachtShow.com/en/media.html.